Robert Kiyosaki is famous (or infamous, depending on your viewpoint) for his break-out book: Rich Dad, Poor Dad. Whichever way you happen to lean on this subject (and, please feel free to share! ), I think that he deserves to be congratulated for thrusting personal finance back into the spotlight, and he equally deserves to be admired for his ability to parlay that first success into a personal finance publishing empire that includes 10 to 20 books, a few games, and so on. In fact, RDPD is one of the very first books on personal finance that I ever read, and is certainly the book that inspired me to look into the field very deeply. It’s unfortunate, then, that Robert Kiyosaki has managed to build up both a cult following and a cult anti-following (?! ), neither of which I ascribe to. 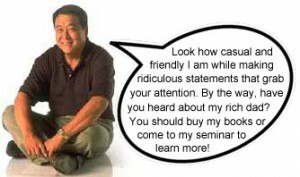 Ahh, so you will now renounce your belief that Kiyosaki is not a quack? 1. His book – at the time – inspired me to look into the field of personal finance a LOT further. 2. I like RK’s definition of liability v asset (albeit, not technically correct, he says an ‘asset puts money in your pocket, and a liability takes money out’. Neat!). 3. I think that RK became rich because of his book, and was worth ‘only’ circa $1.5 mill. (give or take $500k) before. I base this last assessment purely on a statement he made in RDPD (or one of his later books, perhaps Cashflow Quadrant? … I’m working from memory, here, as I have filed his book away somewhere) that he ‘retired’ to write that first book (or was it to create his board game?) on passive income of $100k p.a., driven primarily by real-estate. … I firmly resolved that I would study the field of personal finance, apply what I learned, and (hopefully!) become rich in the process, THEN write about it from the standpoint of a REAL self-made, multi-millionaire entrepreneur and investor. This entry was posted in Rich and tagged 7million7years, kiyosaki, millionaire, money, Rich, wealth by Adrian. Bookmark the permalink. NOthing wrong with legitimate people selling their product. The truth is that most people lack the discipline to properly follow a system, or to make the necessary sacrifices. What do you need to legitimize yourself, 500K? When I hit the mark I’ll be in your neighborhood with a seminar for you to attend. I’m glad I read RK books after I read regular pf books. Had I read his book First I would be deep in debt. He has good points, however you cannot listen to him 100%. I’m glad I knew the basics of of before I dove into the book. I will concede the many people find RDPD motivating. If he encourages more people to achieve financial independence that is a very positive thing. The emphasis on building assets is a good point – but hardly rocket science. However, I have a lot of issues with a lot of his supposed advice and the lack of consistency in his statements and claims. One of his most ridiculous assertions is that a home is a liability. Quiet frankly, the guy has negative credibility. … as you say, well worth watching! I don’t believe this Darren Brown system. There are way too many obstacles that could stand in the way of any race to actually predict who will win.You may make a couple winning bets , but then your doomed sooner or later to fail. As for rich dad poor dad, never read the books (yet) so I don’t have anything to say for or against his ideas. Watch Derren flip a fair coin with a fair toss for 10 heads in a row, and you’ll understand how! Robert Kiyosaki – It’s either you love him or you hate him. If this system works,why isn’t he the richest man in America or in The World? Seriously, Derren is trying to make a point (as am I) … to find out how he dupes somebody into believing that The System actually works, you should try and find the full set of videos, it’s worth watching!